Seconds (1966) was the conclusion of John Frankenheimer’s informal paranoia trilogy – three films he made during the 1960s that reflected the darker side of America, which can be traced back to the loss of innocence with the assassination of President John F. Kennedy. With The Manchurian Candidate (1962), he tackled politically motivated killings. Seven Days in May (1964) addressed the fear of nuclear war and the rising tensions of the Cold War. Seconds is a much more intimate film that critiques capitalism, showing the American dream gone sour. The film starts off with the legendary Saul Bass’ nightmarish opening credits and never looks back. The montage of distorted images of the human head set the tone of protagonist Arthur Hamilton’s (Randolph) desire to radically change his looks and foreshadows the disastrous effects of this action. Frankenheimer establishes an edgy, paranoid vibe early on through off-kilter camera angles and tracking shots as Hamilton is pursued by a mysterious man through a crowded train station. Everything about this sequence, from the way it’s edited to the insert shots, creates an air of instability, of something not right. Hamilton leads a perfectly normal life with a 9-to-5 job in the city and a nice wife and a home in the suburbs to come home to at the end of the day. Despite this, he’s unhappy with how routine his life has become. To this end, he gets involved with a shadowy company that offers to literally reinvent his life through expensive cosmetic surgery and faking his death. A new identity and a new life are created for him. Hamilton becomes Tony Wilson (Hudson), a considerably handsome man with a new lease on life, but he is unable to escape the ramifications of his Faustian pact. 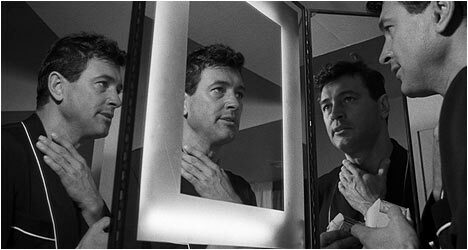 Rock Hudson delivers what is arguably his best performance as a man suffering from a mid-life crisis and decides to do something about it. He does an excellent job of conveying how Wilson adjusts to his new life of an artist. He also has to get used to the face staring back at him in the mirror. It is fascinating to see the tentative steps Wilson takes, gradually acclimatizing himself. Seconds is a classic careful-what-you-wish-for parable as Hamilton realizes over time that no matter how much money you spend to reinvent yourself you cannot escape your true nature. He goes from an early ‘60s Mad Men-esque life to a late ‘60s bohemian hippie lifestyle. Hamilton’s journey is one of discovery as he tries to figure out what he really wants out of life – certainly an admirable goal. However, Hamilton selfishly spends all kinds of money to escape his old life, leaving behind loved ones and responsibilities for a new life that is handed to him on a silver platter. He didn’t earn it and in this respect, Seconds anticipates our contemporary reality television-obsessed culture where people become famous for doing nothing, who earn money for being a heightened version of themselves. Criterion’s Blu-Ray edition of Seconds features an impressive looking transfer that showcases cinematographer James Wong Howe’s stunning black and white camerawork. The detail and depth of image is superb and all scratches and dirt have been removed while still preserving the filmic look. Ported over from the out of print Paramount DVD is director John Frankenheimer’s informative and frank commentary. He isn’t afraid to admit the film’s shortcomings, specifically its failure to connect with a mainstream audience. He also gives credit where credit is due; pointing out that it was Rock Hudson’s idea to have the protagonist played by two different actors. This is an excellent and revealing commentary. “Alec Baldwin on Seconds” features the actor talking about Frankenheimer and the film. They had worked together on the director’s last movie and Baldwin shares an entertaining anecdote about the man. He also speaks admiringly of Rock Hudson’s performance, citing specific scenes that resonate. “A Second Look” features interviews with Frankenheimer’s wife Evans and actress Salome Jens. The latter talks about how she was cast and her impressions of working with Frankenheimer. Evans shares some fantastic anecdotes about how the film came together, like how her husband wanted to cast Laurence Olivier, but the studio wanted a bigger star – hence the eventual casting of Hudson. “Palmer and Pomerance on Seconds” is a visual essay on the film. Scholars R. Barton Palmer and Murray Pomerance analyze the film’s style and themes in detail. There is a vintage interview with Frankenheimer from 1971 where he talks about his philosophy on filmmaking and how other art forms influenced his own work. Finally, there is “Hollywood on Hudson,” a rare WNBC news special that was shot on location in Scarsdale, New Jersey. The actor briefly talks about his character and working with Frankenheimer.